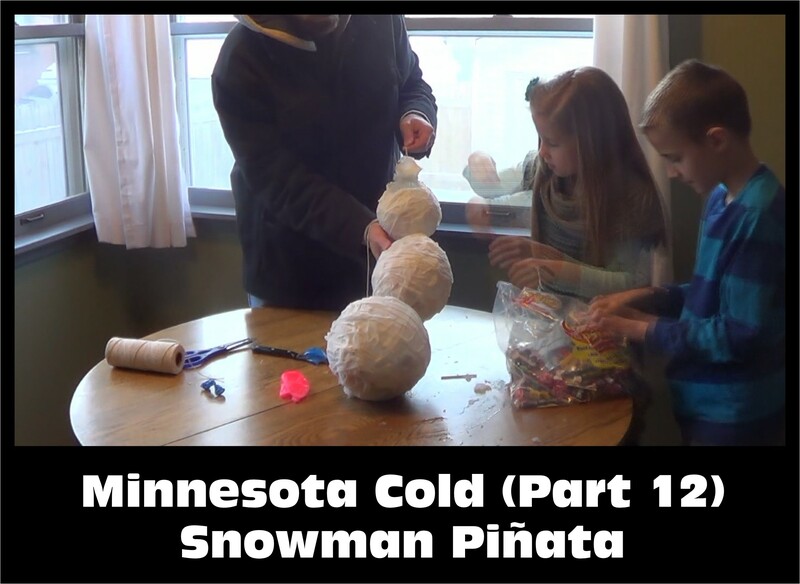 Minnesota – It’s so cold that… you can make a piñata with water instead of paste. Watch and subscribe all of the Minnesota Cold Weather Experiments: www.youtube.com/nziegler . Blow up the three balloons, making one large, one medium, and one small one. Dip the strips of paper towel in the warm water and cover the balloons. Use the pans or large plates to catch the water under each balloon. Cover the balloons completely with a layer of paper towels. Repeat Step 2, this time placing the strips at a perpendicular angle to the first layer of paper towels. When finished, the balloons should have two layers of paper towels. Set the balloons outside to freeze. Once frozen, bring the balloons back inside. Cut a rectangular flap on each of them and remove the deflated balloon from inside the frozen paper towels sphere. For the largest sphere, keep the tail of the balloon on it so you can later tie the string to it. Take a long piece of string and tie it to the end of the largest sphere. Cut two small holes on each end of the other two balloons. String together the spheres so they are stacked in a column of three, looking like a snowman. Leave extra string on the top. Stuff the parts with candy and cover the openings with more paper towels. Using a marker, draw on the snowman’s face on the top and smallest balloon. Add doodles. With the extra string at the top, hang up the snowman piñata. Take the bat and have at it! Make sure the balloons are entirely covered with the paper towel strips when coating them.